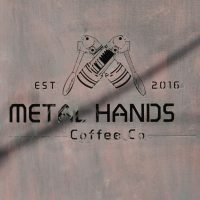 Metal Hands Coffee Co is a small Beijing roaster/coffee shop chain which started in July 2016 with this, the original. When I visited, exactly a year ago in December 2017, following a tip-off that morning from the barista at Soloist Coffee, it had already expanded to four coffee shops, all in a small area in the Andingmen Residential District, centred on Wudaoying Hutong, a narrow old-fashioned alley which is home to Metal Hands. There’s not much to Metal Hands, just a simple store front, with the counter on the right, and seating on the left, plus a small seating area in an annex at the back. However, that doesn’t stop Metal Hands offering a standard espresso-based menu using a house-blend, plus four single-origins which are available through the V60 and as cold brew. The espresso by the way, is pulled on an old-school lever machine after which the shop/chain is named. Metal Hands Coffee Co is on Wudaoying Hutong (a Hutong is an old, narrow alley, often lined with one- or two-storey buildings, although many have disappeared in Beijing, falling foul of re-development) just south of Ditan Park across the 2nd Ring Road. Although far from the sights of Tiananmen Square and the Forbidden City, it’s worth it, both for Metal Hands itself and for the surrounding area, where Ditan Park/Temple of Earth are worth a look. Metal Hands has a small shop front on the north side of the street, three floor-to-ceiling windows running the full width, each with eight black-frame panes of glass, although the right-hand window is, in fact, a door. This is accessible via two broad, tiled steps, with a two-person bench, complete with round table, off to the left if you want to sit outside. The counter faces you immediately you step inside, running the length of the right-hand wall, the lever espresso machine directly in front of you on the counter’s short end. This beauty, by the way, gives Metal Hands its name, the twin levers being its “metal hands”. There’s a surprising amount of seating, with a wooden box-bench running a short way along the front windows, before turning 90⁰ along the full length of the left-hand wall. There’s enough room for eight people along the wall, where you’ll find four small, oval tables, and space for three more people in the window. The bench, by the way, is open at the front, so you can store bags and coats underneath. A small extension at the back on the left completes the seating, with windows in the back and right-hand walls, plus a glass skylight. A high, central table is surrounded by an n-shape bench which seats another 12. Overall, Metal Hands, with windows front and back, is a bright space during the day, while in the evenings, multiple exposed bulbs provide cosy, subdued lighting. The stone-tiled floor, plastered walls and open, wooden A-framed roof, all add to a relaxed, welcoming décor (in contrast to another branch, Metal Hands White Space, a few doors down the street). During my visit, the espresso was a blend of a washed Guatemalan and natural Ethiopian, while there were four single-origins on pour-over. I really liked the look of the pour-over menu (featuring a washed Kenyan, honey-processed Costa Rican and two Panamas, a natural and a washed Geisha). However, I was drawn to the lever machine, having a flat white instead, the espresso blend going really well in milk, producing a lovely, creamy drink. I paired this with an equally rich and creamy cheesecake, one of three cakes on offer, the other two being Chinese (Quemo and Zhe Shi). The service, by the way, was exemplary, my coffee coming with a glass of (warm) water and my barista going out of his way to show me the other branch along the street (White Space) as well as letting me know about The Corner, another excellent Beijing coffee shop. For another view of Metal Hands, please see this by fellow blogger, Sugared n Spiced. This entry was posted in Beijing, Cafe/Roaster, Cake, Coffee Shops, Evening Opening, Laptop Friendly, Saturday Short and tagged China2017, include, Metal Hands by Brian Williams. Bookmark the permalink.